The popular Mummy Mystery is a great effect based on a fantastic method. And most of us had it and still have it. But, for such a great principle, the routine gets over too quickly. So here are some ideas to add more phases to it. Of course, you can use these only if you own Mummy Mystery - so ensure you have one before buying this ebook. Phase One - The performer reads the mind of a participant. Phase Two - The performer reads the mind of a second participant within the same process. Phase Three - The performer successfully conducts a 'group telepathy' experiment. Phase Four - The performer gives a brief but accurate personality reading to the first participant. Of course, this phase is optional, based on your performance persona and style. The reactions you are going to get with this extended routine will be much bigger than the ones you are used to getting with the standard routine which comes with the instructions of the product. And you will come across as a mysterious mind wizard rather than just a clever performer. 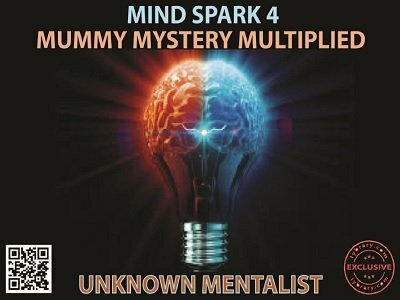 SPECIAL BONUS : Also included is a propless version of Mummy Mystery where in the participant makes all the choices only in her mind and the performer is able to accurately predict the outcome, without actually having to use Mummy Mystery props at all. All of the above 4 phases can be done in this version too. So to perform this version, you need not own the Mummy Mystery set. Just one of many available out in dealer magic effects land. All effects of the magic variety can and should be worked with new methods of presentation in mind don't be put off by price or simplicity it is your own performance skills that create the illusion.